Wyoming Shifters: 12 years later series is set in the same universe as Whitedell, Gillham , and the Council enforcers and follows the stories of the children of the original characters. 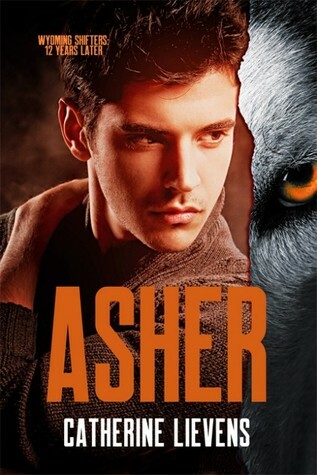 Asher is the first book in a new spin-off series called Wyoming Shifters: Twelve years later by Catherine Lievens. I was bummed when I found out that the Gillham Pack series had ended and so I was so excited by this new series. It’s also set in the Gillham pack but it takes place twelve years later, and we now get to watch the former kids of the Gillham pack find their mates. Fans of the Gillham Pack series will love this new series. I know that I do. This book is Asher and Terry. Terry’s dad is Shawn, and he’s mated to Jarah who’s a nix. Terry had a hard time getting over his dad marrying Jarah and moving them to the Gillham Pack. He didn’t know that his dad was bisexual and so that came as a big shock for him. His one light in the dark was his friendship with Asher. They were so close that Asher was like another son to Shawn and Jarah. Terry’s feelings for Asher changed as he got older but he was afraid of trying for a relationship because he didn’t want to be hurt when Asher found his mate and dumped him. Trying to protect his heart, he kept his feelings to himself and only dated women. He never told anybody that he was bisexual like his dad. Asher knew that Terry was his mate from when they first met at the age of twelve but seeing how angry Terry was about his dad and Jarah and the whole fated mate’s thing, Asher decided to keep that fact to himself. He would have told Terry after they turned eighteen, but by then Terry had started to date girls and Asher thought he was straight and he didn’t want to force him into a relationship that would make him unhappy. When Terry gets dumped by his girlfriend of a year, he flees back home to the comfort of his family and best friend, Asher. He ends up getting drunk, and Asher is tasked with taking him home. After putting Terry to bed and thinking that he’s asleep, Asher makes the mistake of telling him that they’re mates before heading home. But Terry wasn’t asleep and hears what Asher said. Terry’s angry that Asher would keep such a secret from him for so long but as his dad points out to him, Terry isn’t blameless since he never told Asher that he was in love with him either. Both men were only trying to protect their hearts but will they have the courage to be mates now that they know how the other feels? Or will Terry go back to his ex-girlfriend when she comes crawling back? You’ll just have to read the book to see how they fumble through being more than best friends. I loved the pet a shifter benefit for the animal shelter, and it was one of my favorite parts of the book. I also loved Menace and Doggy. I can’t wait to read the next book in the series.